Shop News & An Update! Happy Tuesday everyone! Sure hope the sun is shining where you are. It’s not here so instead I give you a new colorway (I have shared this before but it’s just so happy and fun!) 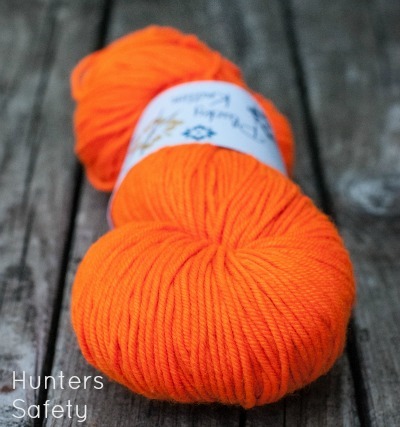 Hunters Safety (looks great with everything gray) this one requires sunglasses! If that’s not an eye opener I don’t know what is! Thank you for joining us during last week’s update. For those of you who are not in the Plucky Group on Ravelry (please join us – what a lovely, fun, sweet and very talented group of knitters/crocheters we have) I wanted to let you know that we are working on a remodel of the Plucky blog/shop site. Please bear with us as this will be developing over the next several months. As part of the refurbishing of the Plucky site, we will also be having more frequent (i.e. weekly) pre-order updates (this, in addition to the Instant Gratification Updates that will being occurring after the Plucky Retreat at the end of April). All of this in an effort to get you yarn regularly and as quickly as the hand dyed process will allow. If you are not familiar with our Frequently Asked Questions, here you go. This explains so much. About that update! Tomorrow, Wednesdayday, April 10th at 9:00 a.m. Eastern the plucky blog. Please join us – it’s the place to be! All of the Plucky bases (except Bulky) will be available. That means you can pick your (available) color and have it dyed. Just.For.You. Please note: This is a pre-order update and ships according to our pre-order policy. https://www.thepluckyknitter.com/wp-content/uploads/2017/05/new_small_logo@2x.png 0 0 Sarah https://www.thepluckyknitter.com/wp-content/uploads/2017/05/new_small_logo@2x.png Sarah2013-04-09 09:20:062013-04-09 09:20:06Shop News & An Update! It is almost impossible to believe (for me anyway) that primo has been around for almost three years now. Three Years!. Seems like just yesterday (I sound like a mom talking about her baby) I committed to my first shipment of my very own custom base. Holy buckets but I was scared (in fact I still get a little antsy every time I place an order – the quantities I am obligated to just do that to me) but fast forward to today. Today I need to talk to you about a price increase. Primo – three year old primo – has never had a price increase. In fact none of the Plucky custom bases have ever had a price increase. However, Plucky has absorbed no less than four price increases on base yarn as well as postal increases and other transportation cost increases. Long story short…. in May there will be a price increase across the Plucky bases, especially on the whole Primo line. Worsted included. Primo Worsted will be brought in line with the price of all other Primo bases. Please know I/we are doing everything we can to continue to make this an affordable luxury. I do not have all the information right now to offer you as far as final prices, etc. That is being worked out and more information will be forthcoming as soon as possible. We do not take this lightly and want it to be manageable for all – for you, our dear Plucky friend/customer and for Plucky. We wanted to let you know this right away as I want you to have time to plan. Thank you so much for, well, everything.